Humorous nonsense poetry making fun of the liar-in-chief. Much larger than the first volume, this one expands into many more types of poetry, and is illustrated. "Making fun of" is right. 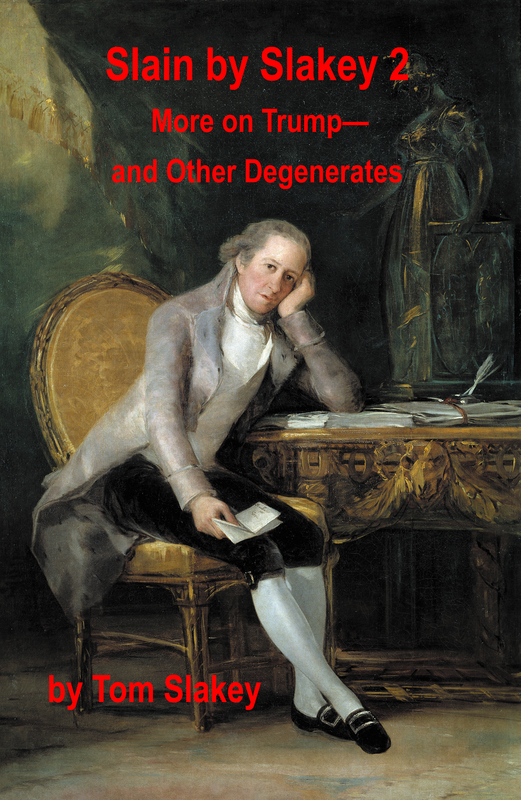 It is amazing to be able to find humor in the lovely situation that is the Trump White House, and in the wonderful specimens of humanity the MeToo movement confronts, but that is just what this book does! 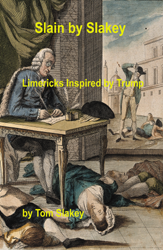 Maybe because the limerick is childish, somehow it lends itself perfectly to mocking a perpetual child now in his second childhood! A friend purchased the Slain books for her father, who was in the hospital recovering from throat surgery. They made him laugh so much it hurt badly, but he couldn't stop reading! This is the second in this series of young adult mysteries about a teenage detective named Tyler Teague. A couple of years have gone by, and Tyler is spending the weekend as a prospective student at St. John’s College in Santa Fe, New Mexico. A statue has been stolen from the college, setting up a mystery in which Tyler must solve a logic puzzle, as happened in the previous story (Tyler Teague and the Particulars). Tyler is up against the same villains as before. This mystery is gripping and perfectly readable whether or not one wants to tackle the logic puzzle built into it. The differences between this book and the last are that this one is much longer, contains more logic puzzles, and the puzzles are much harder. The central “Einstein Puzzle” on which this mystery is based is said to be so difficult that only two percent of the population can solve it, a nice challenge. This book is a paean to St. John’s College and to Santa Fe, New Mexico, both of which the author clearly loves. It is great reading for any fan of mysteries, anyone who enjoys both (right-brain) reading and (left-brain) puzzles, and anyone who wants to hear more about college life. Suppose you are a high school student in the throes of applying to colleges. Wouldn’t it be nice to be able to read about what the college visit (prospective weekend) might be like? This book shows that, and it is difficult to find any other book that does. 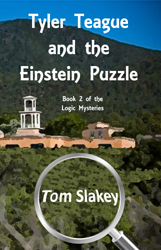 “Logic Puzzle as Mystery Novel! Highly recommended. The perfect book for introducing teenagers to the fun of logical thinking. Fans of logic puzzles, mysteries, or Sudoku will all love this book.” Gwen Bindon, Retired School Principal “Loved this book! So much fun. Can't wait for my sons to read it. Would be fun for my students to read and figure out, especially my math and engineering ESL students.” Laura Casellas, College ESL Professor An entirely new type of mystery, a must-read addition for any mystery collector. This book does for logic puzzles what Parnell Hall’s Puzzle Lady series does for crosswords. Boarding school sophomore Tyler Teague stumbles across a mystery: a valuable painting has been stolen from his school. He has a hunch: the whole situation is feeling a lot like a logic puzzle. But will he be allowed to solve it, and will he be in time to prevent a catastrophic loss? So who likes humorous left-wing political poetry? Liberals would like my Slain books and conservatives would loathe them. Yes, I'm alienating half the country, which they say never to do. As a child, I came to love nonsense poetry, such as Edward Lear and Lewis Carroll. Now I find that the same kind of nonsense poems work well for mocking politicians who have nonsensical policies. I've gotten a pretty good response to my mocking of Trump above all, the most ridiculous and mockable person ever to hold the office of President. 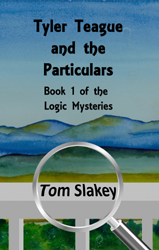 And who likes logical mysteries? I'll generalize that readers tend to be right-brained, and logical types like scientists and mathematicians tend to be left-brained, so maybe not many people will like these books. An odd Venn diagram intersection of folks who are strong in both the right and left brain. Scientific types who like to read fiction. Actually, I have found that software developers like crossword puzzles, whereas writers like sudoku—people like their recreation to be in the other half of the brain from their work—so maybe there's hope for my logical mysteries after all. 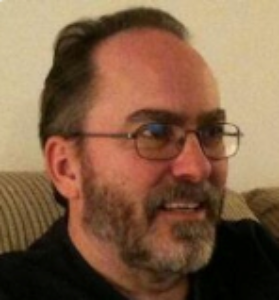 I suggest using the links at left to check me out on Facebook and Twitter. Also, go to Amazon.com, search for Tom Slakey, and use LookInside to read the first 20% of my books: I predict that you're going to love them!